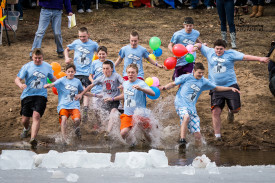 For the fifth year in a row, students at Liberty School will be jumping into the freezing waters at Moorman Lake in Quincy as part of the Law Enforcement Polar Plunge for Special Olympics Illinois. The Liberty team has steadily grown in size from 15 plungers to 31, with additional people raising money for the Plunge despite not being able to take part in the chilly event. 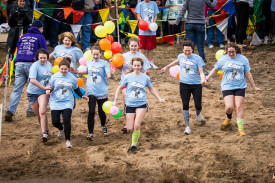 Those who couldn’t plunge raised money anyway because “it was for such a great organization,” said Chevi Ingalls, Liberty teacher and Student Council advisor. Each year, the Liberty team dresses in costumes. “We have dressed as superheroes, minions and my favorite year, we had balloons to represent the movie “Up,” said Ingalls, noting they won the costume contest that year. The school, with about 280 students in grades 7-12, won the Cool School Challenge for the Quincy Plunge in 2015. Forty-one students raised $3,692.05 for Special Olympics athletes. “Our kids were so excited about getting a trophy. They all worked so hard to raise money,” said Ingalls. Each student is responsible for raising the minimum amount to plunge ($100 this year), said Ingalls, adding that the team organized hat days at school for the students and jean days for the staff to help raise money. Throughout the entire process of planning for the Plunge by selecting a theme, designing T-shirts and getting the costumes ready, the Liberty team has fun. “The Plunge day is always fun because we all get so nervous about freezing for a reason,” she said. The team will be plunging again this year at 12:15 p.m. Saturday, Feb. 27, at Moorman Lake, Upper Moorman Park, Quincy. If you are interested in joining Liberty School at the Quincy Plunge or want to plunge at any of Illinois’ 21 locations, visit PlungeIllinois.com.